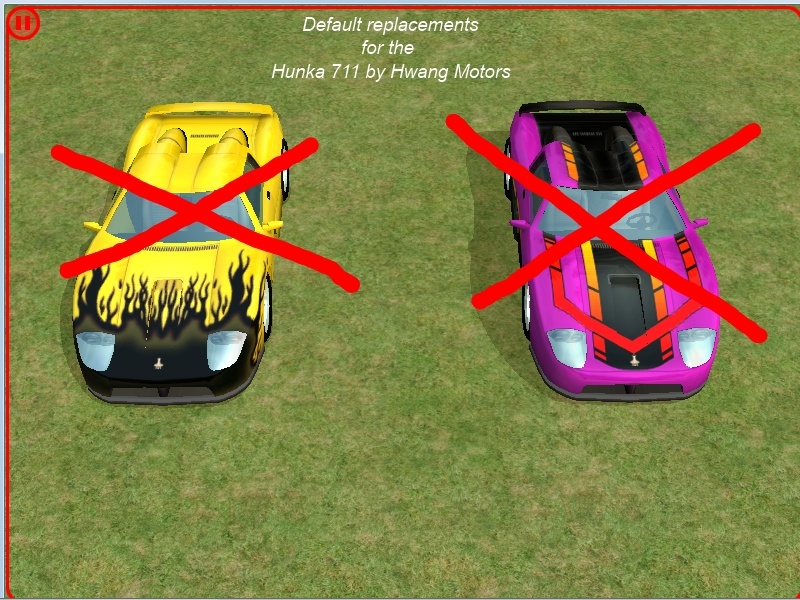 This is a set of texture replacements for the Hunka 711 by Hwang Motors, the expensive sports car from Nightlife. It is divided into multiple sets, and each set is in its own rar file. 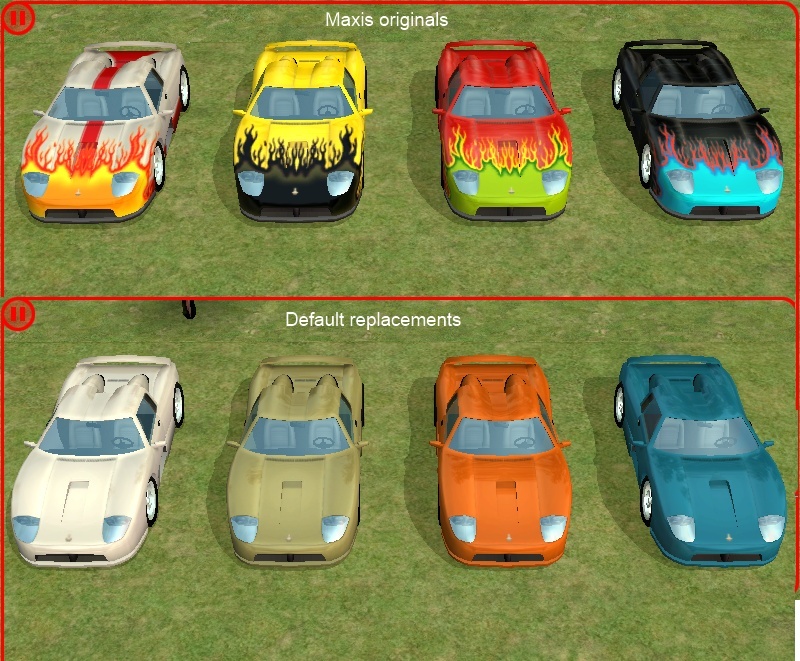 Most of the replacement textures are from Michelle's set of car recolors. The light blue replacement is from simdebster's Smoogo Blue set, and the red replacement is from her Antique Red set. (The Antique Red set also includes a couple of custom interiors for the Hunka.) The replacements with racing stripes were retextured by me, and the darker blue recolor used in the "no flames" set is mine. I have added lod90 textures, as I understand that they may affect how the cars appear in the neighborhood view. All textures are compressed with SimPE. First, here's the replacement for the flaming paint jobs. The blue is mine, based on Michelle's LACK blue, and the other replacement colors are Michelle's white, gold, and orange. Click the button to see a before-and-after pic. Next, I replaced the "blackdiagonals" model with Michelle's purple. The next set replaces the Maxis black, silver, yellow, and red with Michelle's black, silver, and yellow, and simdebster's Antique Red. This may affect the yellow sports car that appears in neighborhood-view traffic. 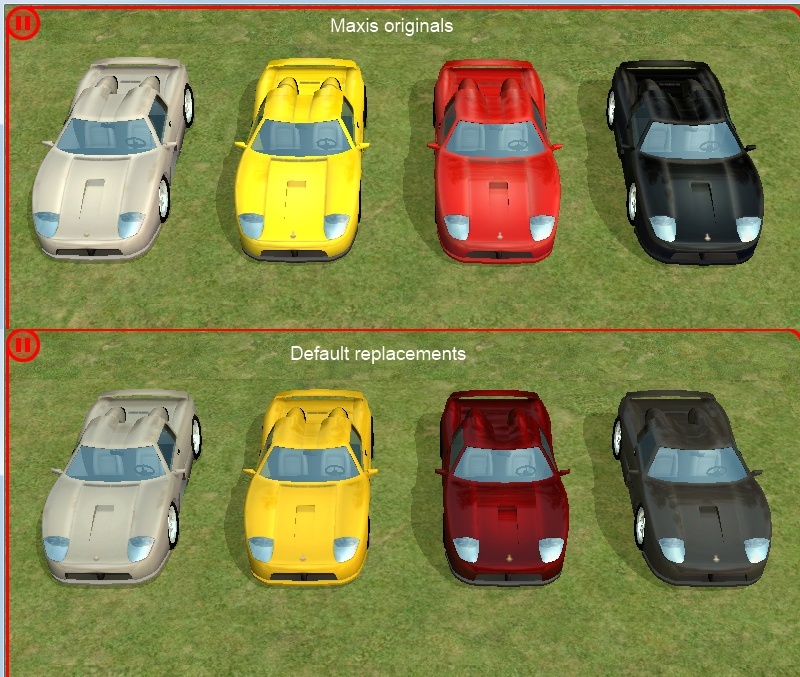 The yellow sports car used as a top-level carpool should not be affected, as it uses a separate texture. I wasn't sure what to do about the racing stripes, so I made two replacement sets for them. 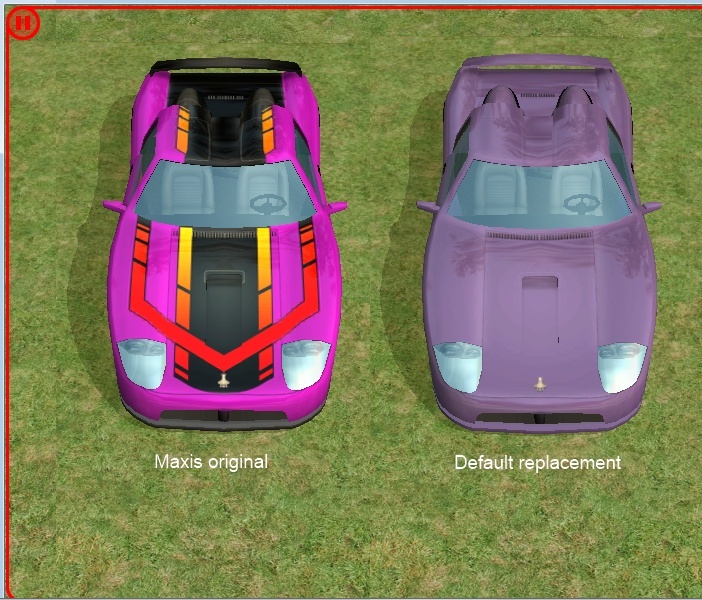 For one, I added the Maxis racing stripes to the replacements for the solid colors. I stayed with the Maxis scheme except for the red, where I used a white stripe instead of the black that Maxis used. For the other, I replaced the Maxis silverstripes, yellowstripes, and redstripes with Michelle's turquoise, green, and pink, and replaced the Maxis blackstripes with simdebster's Smoogo Blue. 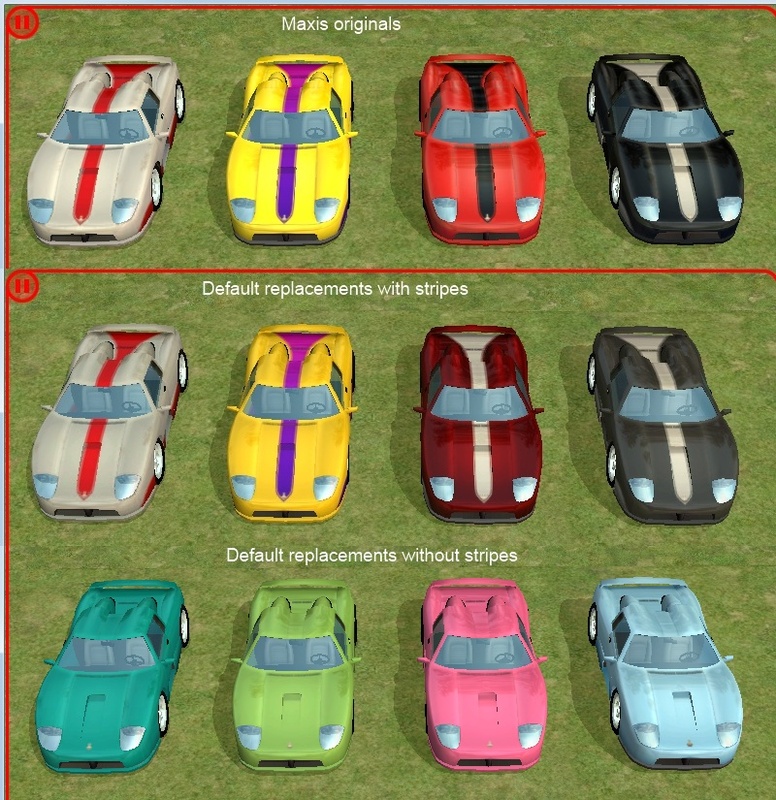 Each replacement is in a separate package file, so you can mix-and-match as you choose, though you can only have one replacement for each car. Each set is in a separate rar file, and each rar contains a before-and-after pic. February 29, 2016: Non-default versions of the darker blue recolor and the striped retextures are available in this thread. Michelle and simdebster, for the replacement textures. Michelle and [URL=http://modthesims.info/m/17078[/URL], for the replacement textures.